These devices are supposed to indicate hottest spot in the winding based on the manufacturers heat run tests. At best, this device is only accurate at top nameplate rated load and then only if it is not out of calibration. They are not what their name implies and can be misleading. They are only winding hottest-spot simulators and not very accurate. There is no temperature sensor imbedded in the winding hot spot. At best, they provide only a rough approximation of hot spot winding temperature and should not be relied on for accuracy. They can be used to turn on additional cooling or activate alarms as the top oil thermometers do. Winding temperature thermometers work the same as the top oil thermometer, except that the bulb is in a separate thermometer well near the top of the tank. A wire-type heater coil is either inserted into or wrapped around the thermometer well which surrounds the temperature sensitive bulb. In some transformers, a current transformer (CT) is around one of the three winding leads and provides current directly to the heater coil in proportion to winding current. In other transformers, the CT supplies current to an auto-transformer that supplies current to the heater coil. The heater warms the bulb and the dial indicates a temperature, but it is not the true hottest-spot temperature. These devices are calibrated at the factory by changing taps either on the CT or on the autotransformer, or by adjusting the calibration resistors in the control cabinet. They normally cannot be field calibrated or tested, other than testing the thermometer, as mentioned. The calibration resistors can be adjusted in the field if the manufacturer provides calibration curves for the transformer. 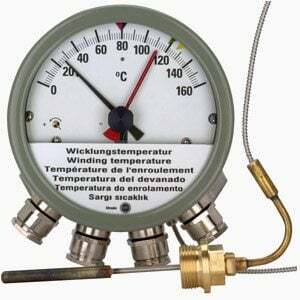 In practice, most winding temperature indicators are out of calibration, and their readings are meaningless. These temperature indications should not be relied upon for loading operations or maintenance decisions. Fiber optic temperature sensors can be imbedded directly into the winding as the transformer is being built and are much more accurate. This system is available as an option on new transformers at an increased cost, which may be worth it since the true winding “hottest-spot” temperature is critical when higher loading is required. Thermometers can be removed without lowering the transformer oil if they are in a thermometer well. Check your transformer instruction manual. Look carefully at the capillary tubing between the thermometer well and dial indicator. If the tubing has been pinched or accidently struck, it may be restricted. This is not an obvious defect, and it can cause the dial pointer to lock in one position. If this defect is found, the whole gage must be returned to the factory for repair or replacement; it cannot be repaired in the field. Look for a leak in the tubing system; the gage will be reading very low and must be replaced if a leak is discovered. Thermometers should be removed and tested every 3 to 5 years as described below. Transformer temperature thermometer - Type MSRT 100 LJB by CEDASPE s.p.a.
Every 3 to 5 years, and if trouble is suspected, do a thermometer testing. Suspend the indicator bulb and an accurate mercury thermometer in an oil bath. Do not allow either to touch the side or bottom of the container. Heat the oil on a hotplate while stirring and compare the two thermometers while the temperature increases. If a magnetic stirring/heating plate is available, it is more effective than hand stirring. Pay particular attention to the upper temperature range at which your transformers normally operate (50 °C to 80 °C). An ohmmeter should also be used to check switch operations. The alarms and other functions should also be tested to see if the correct annunciator points activate, pumps/fans operate, etc. If it is not possible to replace the temperature gage or send it to the factory for repair, place a temperature correction factor on your data form to add to the dial reading so the correct temperature will be recorded. Also lower the alarm and pump-turn-on settings by this same correction factor. 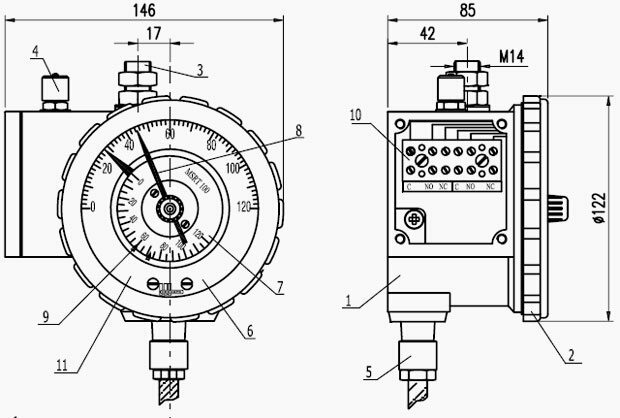 Since these are pressure-filled systems, the indicator will typically read low if it is out of calibration. Field testing has shown some of these gages reading 15 °C to 20 °C lower than actual temperature. This is hazardous for transformers because it will allow them to continuously run hotter than intended, due to delayed alarms and cooling activation. If thermometers are not tested and errors corrected, transformer service life may be shortened or premature failure may occur. The article is great and gives very useful tips on winding temperature devices.